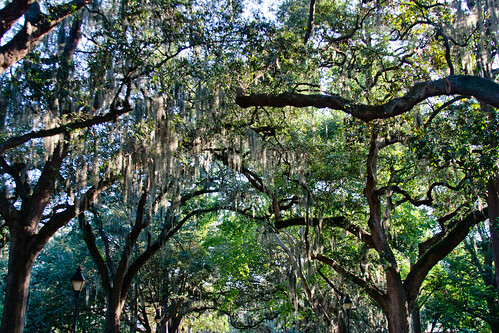 Walking and playing in Forsyth Park. MIT mini-reunion July 2011 in Savannah, GA.
Spanish moss (Tillandsia usneoides) is a flowering plant that grows upon larger trees, commonly the Southern Live Oak or Bald Cypress in the southeastern United States. It closely resembles its namesake (Usnea, or beard lichen), but in fact it is not biologically related to either mosses or lichens. Instead, it is an angiosperm in the family Bromeliaceae (the bromeliads) that grows hanging from tree branches in full sun or partial shade. It ranges from the southeastern United States (as far north as southern Virginia and eastern Maryland) to Argentina, growing wherever the climate is warm enough and has a relatively high average humidity. It propagates both by seed and vegetatively by fragments that blow on the wind and stick to tree limbs, or are carried by birds as nesting material.